His father avoided compulsory military service due to a withered arm he sustained when putting out a fire.At the end of World War II the family returned to the village of Chemolgan, and Nazarbayev began to pick up the Russian language. He performed well at school, and was sent to a boarding school in Kaskelen. After leaving school he took up a one year, government-funded scholarship at the Karaganda Steel Mill in Temirtau. He also spent time training at a steel plant in Dniprodzerzhynsk, and therefore was away from Temirtau as riots over working conditions enveloped the town. By the age of 20, he was earning a relatively good wage doing "incredibly heavy and dangerous work" in the blast furnace. He joined the Communist Party in 1962, and quickly became a prominent member of the Young Communist League. He soon became a full-time worker for the party, and picked up a college education at the Karagandy Polytechnic Institute. He was appointed secretary of the Communist Party Committee of the Karaganda Metallurgical Kombinat in 1972, and four years later became Second Secretary of the Karaganda Regional Party Committee. In his role as a bureaucrat, Nazarbayev spent his days dealing with legal papers, solving logistical problems and industrial disputes, as well as meeting workers to solve individual issues. He later wrote that "the central allocation of capital investment and the distribution of funds" meant that infrastructure was poor, workers were demoralized and overworked, and centrally set targets were unrealistic; he saw the steel plant's problems as a microcosm for the problems for the Soviet Union as a whole. 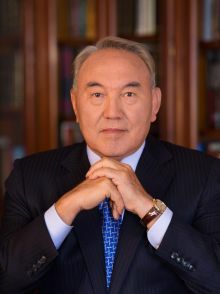 In 1984, Nazarbayev became the chairman of the Council of Ministers, working under Dinmukhamed Kunayev, the First Secretary of the Communist Party of Kazakhstan.He served as First Secretary of the Kazakh Communist Party from 1989 to 1991. Nazarbayev criticized Askar Kunayev, head of the Academy of Sciences, at the 16th session of the Communist Party of Kazakhstan in January 1986 for not reforming his department. Dinmukhamed Kunayev, Nazarbayev's boss and Askar's brother, felt deeply angered and betrayed. Kunayev went to Moscow and demanded Nazarbayev's dismissal while Nazarbayev's supporters campaigned for Kunayev's dismissal and Nazarbayev's promotion. The Soviet Union disintegrated following the failed coup, though Nazarbayev was highly concerned with maintaining the close economic ties between Kazakhstan and Russia.He won the 1991 presidential election on 1 December, winning 91.5% of the vote in an election in which no other candidate ran.On 21 December, he signed the Alma-Ata Protocol, taking Kazakhstan into the Commonwealth of Independent States.